Which wedge to use for a Meade LX90 10" ACF? Before I go out and buy a new LX90 10" ACF, I would like to know what wedges are available to hold the 10". Also is the fork mount adequate to hold the 10" OTA and be able to produce good astro-pics? I'll take a swing at the last question, for DSOs (planetary is a whole different story). (And for traditional imaging, rather than EAA). Look at what you're doing. Taking fork arms and a base that were designed to accept vertical loads in tension, and giving them bending loads, which must be harder to handle. You'd be relying on everything being significantly overdesigned, which would increase weight, and cost Meade more. The difference between the price of the OTA and the OTA + fork mount is $700. A suitable (DSOs, traditional imaging) GEM (which is designed to handle the load) for the 26 pound optical tube plus camera plus accessories would be around $2500. Do you think the fork mount is some incredible bargain? Could it work? Possibly, but I'd say it's significantly less than an even money bet that it would work well. More likely, it would be bad. Especially when you consider the image scale you'll be working at. Edited by bobzeq25, 21 March 2019 - 10:35 PM. This is the silly 'thought-games' of those who don't know how things work in fork arms. First... there is no 'vertical loads in tension' vs 'bending loads'. Large forked SCTs are built using a large diameter gear on a central bearing. This is driven by a worm gear at sidereal rate (very slow) except during slewing. The difference between nominal operation in alt-az or equatorial on a wedge is not signficant to the drive system as the weight being moved is close around the rotational axis. Starting and stopping the RA axis has far less torque effect than on a GEM or CEM equatorial mount. The difference between an LX90 and an LX200 is that the LX200 has larger gear-worm sets for higher precision. A GEM uses a substantially smaller drive gear with a larger bearing as it has to move a substantially longer and heavier weight-arm. When reversing direction this drive gear takes more abuse due to having roughly 2x the mass of the OTA (Counter-balance weight + OTA). A CEM distributes the mass of the OTA between two bearings and the counter-balance weight only is outboard of one bearing. There are many people in the hobby who have used fork driven mounts for long exposure astrophotography with high degrees of success all the way back to film days before the advancement of stacking images with CCD/CMOS cameras at significantly reduced exposures. I guided an LX200 by eye more than 20 years ago to take images. Today with a guide camera the process is automated just as much for a fork as for a GEM/CEM. The LX90 platform is not ideal for long exposure astrophotography, but that has not stopped peole from doing it quite successfully. As I mentioned above, the LX90 drive system is less robust than the LX200, the fork arms are lighter and the drive system is somewhat smaller. Yet because imaging is done at a sidereal rate of tracking this is far less of an effect especially with guide cameras or an off-axis guider. Both items a GEM owner may use as well to be successful. There are many who don't understand the operation of a wedge because they've never used one. In fact all they are doing is placing the base of the fork at the correct angle to polar align the telescope. The wedge includes adjustements for altitude and azimuth just as a GEM does. The difference is that finer controls for these require buying the better wedges which are pricier. However even the lesser wedges can be used successfully with a little practice as I can atest to that fact. For the LX90 10" the wedge which is specified for the LX200/LX600 are compatible. For 8" LX90 an adapter must be purchased. Meade offers it's X-Wedge, Milburn offers a wedge as well. Even the older Meade Superwedge can be used for the LX90 if you find a used one. Due to the MFG cost of wedges I suggest hunting one down on CN or A*mart where they can sell for substantially less. If you have a permanent location like a pier a wedge is a great piece whether you plan to do visual or not. Uhh, bob knows how these Meade/Celestron AZ-ALT mounts work. I have one, they are great for intro AND for solar imaging. As bob mentioned, they are not suitable for DSO due to image scale. Why is HyperStar so popular for Celestron? Think about it. I did, and have had to re-think my imaging setup. Sorry to burst your bubble but there are thousands of fork mounts imaging DSOs and have been for more than 30 years. There are many professional and educational institutions that use 14" and 16" SCTs on fork mounts in equatorial mode on wedges. As I said above, while the LX90 isn't the suggested fork for DSO imaging, it can and is being used for that purpose as well as planetary, solar, and EAA. There are fork mounts that are _designed_ to handle the bending loads. Your standard alt az SCT mount isn't. Which is the major reason they're so cheap. Tension loads are much easier to handle. Here's what a proper equatorial fork mount looks like (and costs). Note particularly the large cone shaped RA bearing at a 45 degree angle. That effectively converts the bending load into mostly a tension load for most imagers. Standard construction methods (houses, bridges, Formula One cars) are designed to convert bending loads into tension loads. Much cheaper or, in the case of the F1 car, lighter. I used to race a Formula Ford. The back suspension arms could be bent with your bare hands. If you wanted to freak someone out, you could lean on the middle, and flex it noticeably. By design, and using rod ends to isolate the arms from any bending loads at all, they were strong enough in tension/compression to precisely handle the load of a 130MPH race car cornering at 1.4G. An alternative mount design for forks uses computer control and a rotating focuser. As they say, that's how the pros do it. People who defork SCTs (or, more often, just buy the OTA so they don't have to pay for the fork mount) and put them on expensive GEMs are not doing it as expensive jewelry and/or status symbols. Nor do they just like to spend money or deal with meridian flips. Edited by bobzeq25, 24 March 2019 - 01:12 PM. Again with the whole misconcept of 'bending loads'. Exactly how much deflection do you think an 8-14" OTA and it's commesurate fork structure is going to impart at the local angle of polar alignment? The bearings of the Celestron & Meade SCTs aren't falling apart. The weakest link for some seems to be the clutch for the declination, or the non-metallic ball bearing riders on some CPC models and failure is regardless whether used in Alt-Az or EQ. 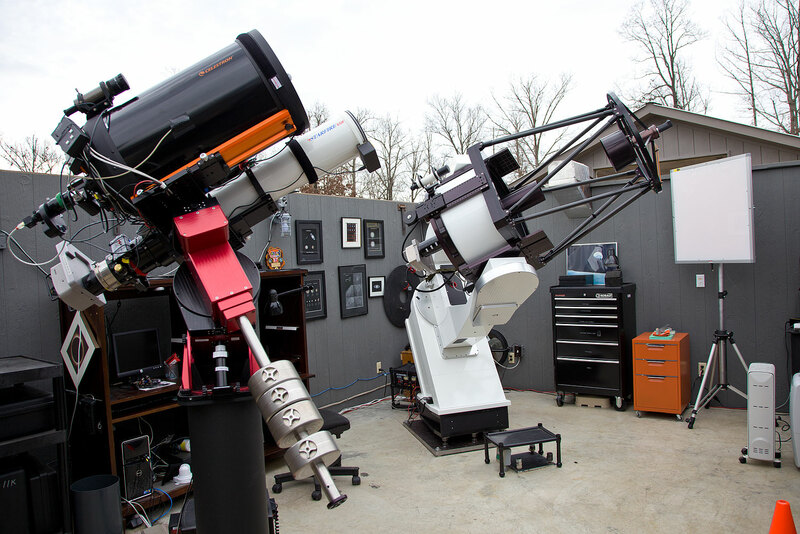 I'm sure you've got $15K laying around for a mount as an amateur... and while some institutions and schools may have the money, they are often concerned with actual delivery dates, so off the shelf SCTs from Meade and Celestron have fit the bill far more than a Matthis drive. Interestingly, NASA sent a Celestron fork arm into space, a CPC 9.25. Must be reliable enough for them.. eh? In that light and vein, there are readily available wedges which are being used today to achieve the goals he seeks. NASA used the CPC 9.25 for planetary, which is a completely different thing. Finally, "which wedge" was not the only question in the original post. "Also is the fork mount adequate to hold the 10" OTA and be able to produce good astro-pics?" Edited by bobzeq25, 24 March 2019 - 06:37 PM. The only reason to buy a wedge is for astrophotography, and the only thing the 10-inch will buy you in this regard over the 8 for imaging is more image scale. An extended object like a galaxy or nebula won't be brighter to the camera, only bigger. The thing is, while better than the 12, the 10's fork is really stressed by the larger tube. The fork/drivebase are the same as on the 8. The fork is just extended to fit these tubes. Do yourself a favor if you want to take pictures--GET THE 8. Anyhow, whether the 8 or the 10, get the largest, heaviest wedge you can find. There's no overkill here. Tipped over on a wedge, an SCT is in an off-center, shaky condition. Finally, it sounds like you are new to imaging. I can think of no more difficult way to begin this difficult art than with a big, long focal length fork mount SCT. I'd get a nice 3 - 4-inch APO refractor and a GEM. But that's just me. Edited by rmollise, 25 March 2019 - 12:39 PM. Nah, it's not, it's both the experts and the people who've actually done this. But, Stargazer3236 is not remotely a beginner. He's imaged a _lot_ with some different scopes. He has a pier mounted CEM60 on his wish list, that could work with the (deforked) scope and an off axis guider. The OTA is 35 pounds, in my opinion the CEM60 can do a bit better than 50% of the stated capacity. So, his post is apt, it's just that the big scope on an alt-az fork mount on a wedge is dubious. Not the best way to step up the game. Edited by bobzeq25, 25 March 2019 - 12:55 PM. A heavy duty mount such as RCOS built.. different story. Sure. Both mounts are not simply "heavy duty". They were engineered to manage the loads, like my 900 pound Formula Ford was. Edited by bobzeq25, 25 March 2019 - 01:19 PM. Piggyback a widefield refractor on the LX90(of any size) and use the main OTA with an .63 reducer as the guidescope. That gets your start... sheesh you guys are such a hoot... 20 years ago we were shooting film on fork arms guiding by eye. And as for paying for all the fancy smancy equipment that costs more than my 12 year old truck... throw your money around for taking snapshots but spending 15K for a mount when $300 gets the job done for the amateur in question. Thousands have satisfied their ROI with SCTs on off the shelf wedges and forks. As far as wobbling wedges... methinks it likely wobbling tripods over-extended-legs rather than side-loaded wobbly wedges. Remember here we aren't talking about mounts rotating like a tire on a car running down the road at 100 miles an hour or a washing machine on a spin cycle... we're talking SLOOOOOW speeds. Still I agree, buy the sturdiest wedge that can be afforded. Milburn or X-wedge is sufficient. The wedge doesn't wobble, it's the alt-az fork mount that does. Just not designed to be used that way. I'm very far from rich, your equipment cost _way_ more than mine did. The $2300 CEM60 I own is, as I said above, likely suitable for that OTA. It's just a case of making smart decisions. Edited by bobzeq25, 25 March 2019 - 04:08 PM. The problem is that even as forks go, this is a light one. So all the problems of any fork on a wedge are exaggerated. Edited by rmollise, 25 March 2019 - 05:49 PM. For sure.. Not mine but I did buy an H-Beta filter from the guy. It's amazing the equipment some folks have.. I guess the best solution for me is to just buck up and buy the CEM60 and get an off the shelf C11 OTA, both of those will satisfy my urge to image bigger, especially the planets. I have my Nexstar 8 OTA and my AT60ED for both close in shots and wide field images, so I have all the bases covered for now. I am looking for a 5 or 6" SCT as a middle scope.